Welding is a popular hobby as well as a profession for some. Maybe your loved one is a full-time welder, or perhaps they just enjoy doing it from time to time. Either way, there is no doubt that you will be looking for a welding themed gift for them sometime in the future. Even if you know nothing about welding, there are a range of different gifts to choose from. Most of these are easy to find and generally quite inexpensive. We have compiled a list of the top nine gifts for welders. There is welding gear, like gloves, helmets and aprons, or pieces of equipment—and even some humorous mugs and T-shirts. Read on to find the perfect welding gift for your loved one! One of the most important pieces of equipment that a welder needs is a helmet. This is vital for protecting the eyes, face and entire head area from burns, sparking, light and heat. It can prevent a variety of painful injuries and conditions that can be caused by welding, including arc eye. Perhaps the welder in your life is just starting out, or maybe they are more experienced and in need of a helmet upgrade. Either way, the Antra Solar Power Auto Darkening welding helmet is a great choice. It features a large viewing area of 3.86 inches by 1.73 inches and a dial for adjusting sensitivity. It also has four premium sensors, which work to automatically darken or lighten the viewing area. This helmet has a wide shade range of 4 / 5-9 / 9-13. Like a welding helmet, a welding cap also provides good protection for the head, neck and ear area. It can be worn under a helmet, to help protect against high levels of heat, or simply with protective glasses. Whether you are buying a cap for use in either situation, you should look out for certain features in this product. These include quality fabrication, breathability, a design that will fit well and good coverage of the head area. The Lincoln Electric All American welding cap has all of these features. It is made from 100 percent cotton and has flat-stitched seams for comfort. The cap is elasticated to ensure a good fit, and it is also conveniently machine washable. It has a high crown design and an air cushion on the inside of the cap. This aids ventilation, ensures breathability and helps to absorb sweat. The welding cap comes in a fun American design print, and has a good-sized protective brim. Matching items, such as do-rags, can also be purchased. Another essential piece of clothing for the welder in your life is a pair of welding gloves. These provide protection to the hand and arm area and prevent damage or injury from heat and sparks. If you are looking to give someone a pair of welding gloves, then our top choice is the Steiner 21923-L welding gloves. Made from select shoulder-split cowhide, these welding gloves are insulated with foam and have a full cotton lining for added comfort. The leather is a burnt orange color, and this material is very durable, while allowing full movement in the hands and resistance to abrasion. The gloves are fully welted and feature a reinforced thumb strap. These are the most popular gloves in the Steiner range and will keep welders of all levels safe. A fun slogan T-shirt is a great gift for any welder, especially if they have a good sense of humor. There are numerous different slogan T-shirts available, but this is one is a favorite of ours. A sarcastic little number, this “Welder hourly rate” T-shirt features a large print that describes potential pay rates for welders. The T-shirt is suitable for men or women, with styles to fit either gender. It is also available in a large variety of colors and sizes. The fabrication is 50 to 100 percent cotton, depending on your chosen color, and some variations contain polyester as well. The hem and sleeves of the T-shirt are double-stitched for quality, and it is machine washable too. 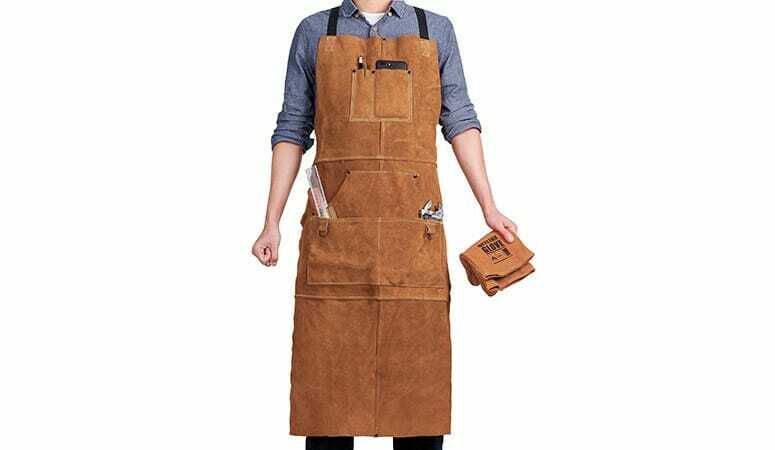 Another useful piece of protective clothing for any welder is a leather apron. This item provides a high level of full-body coverage when working, protecting against damage from heat and sparks. A great gift for a welder at any level is the QeeLink Leather welding apron. This heavy-duty product is made from split cowhide, which is a flame and heat-resistant fabric. The apron is very durable, and the stitching is made using US Kevlar thread which is also resistant to heat. This product is versatile, with six different pockets for work accessories and tools. There is even a pencil pocket and cell phone holder. It is extra long and adjusts to fit most sizes. The apron measures 24 inches by 42 inches, and protects both the torso and the upper part of the legs. 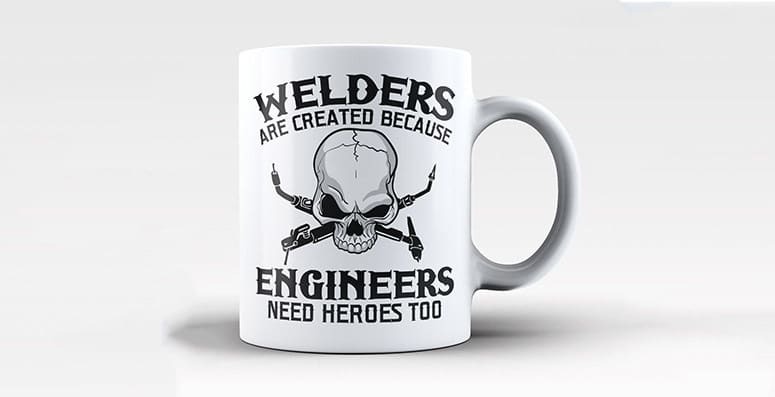 Another potential gift for welders with a good sense of humor is a slogan mug. A variety of designs are available, of course, but we particularly like the Welder Nutritional Facts Label Gag Gift coffee mug. This is a great choice if the welder in your life loves his (or her) tea or coffee. It features a comical print of the nutritional information of a welder: plenty of hard work, skill, pride and—of course—pain tolerance. The mug is made from sturdy and durable ceramic, and is white with black print. It is microwave and dishwasher safe, although it probably won’t withstand the effects of a welding torch! If you are looking for a gift for someone quite artistic, or perhaps that person who has everything and is hard to buy for, then this is the perfect gift. 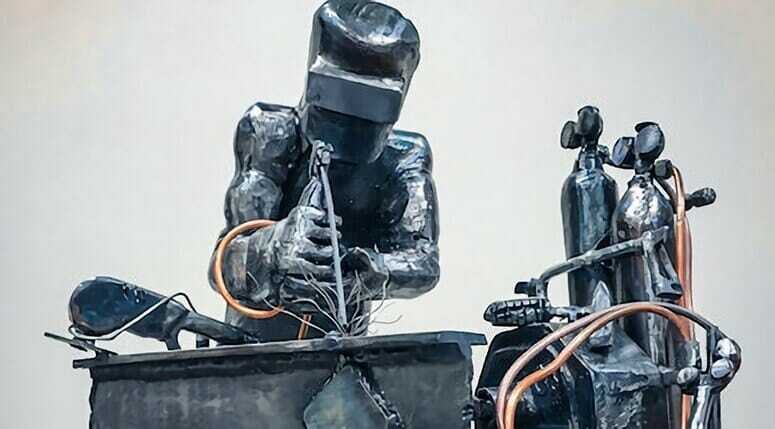 An intricate welder diorama sculpture crafted by hand is a great choice. It is welded—how appropriate—from high-quality steel, nuts and bolts. This unique product measures 7.09 inches by 8.66 inches by 4.33 inches. Metal Diorama and Wood Art make unique sculptures featuring many different activities and sports. You can even request a certain design from the artist if you would like your own idea to be turned into a unique artwork. Perhaps send in a photo of your loved one at work welding, and they can be immortalized forever as a welder. A book is a great gift for either the experienced professional or beginner welder. While the “Welding for Dummies” book may appear to be light-hearted, it is actually a very thorough and informative guide in regard to many aspects of welding. Perhaps the welder in your life is looking to upskill for professional reasons? Or maybe a hobby welder is wanting to build on their skills? Either way, this book gives valuable information covering all kinds of welding, including TIG, stick and MIG. It also tells the reader how to check their materials before use, and gives information on the full step by step process of welding. It even discusses training information and how to get certified if you are looking to become a professional welder. The reader can get tips and information on which welding type is best to use for a new project. Finally, guidance is available on finishing techniques and safety instructions. “Welding for Dummies” is a very informative and practical present for any welder and will surely be appreciated, no matter what level they are at. Last but not least, something to hold everything in! Welding requires a lot of equipment and protective clothing, whether done professionally or as a hobby. A good welding gear bag will have space for all of the essentials, and be sturdy enough to transport them. The Revco GB100 BSX Extreme Gear Pack measures 19 by 12 by 9 inches and weighs just under 1.5 pounds. It is able to hold a welding apron, gloves, angle grinder, and other tools. The bag also has a convenient helmet compartment with a quick action helmet catch. This is a great storage solution for most models of helmet, which keeps it easily accessible. The backpack also features a padded back, comfortable shoulder straps and reinforced pockets on the sides of the bag. It has a handy drawstring compartment, and side loops to safely hold smaller items. This welding gear bag is both fireproof and durable, and it is an absolute must for any welder! As you can see, there are plenty of different options when it comes to buying gifts for the welder in your life. We have found products ranging from practical items and informative books, to light-hearted and tongue-in-cheek fun gifts. Whether it is a friend, family member or significant other, we‘re quite sure that you will find something on this list that they will love.